the little nordic cabin (old): Where do you do your writing? 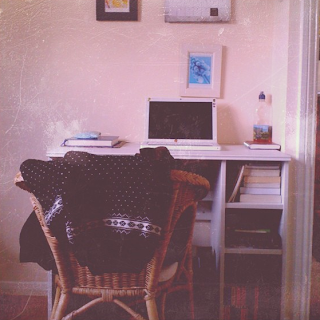 Do you have a cozy place where you like to do your writing? I adored my little room in Norway, especially during the winter when I could curl up at my desk with a blanket and some hot coffee and watch the snow falling while I did my work. I don't write, but for my crafts, I HAVE to be surrounded by all my special things and knick knacks. I have my own craft room now and it's cluttered beyond belief but I love working in there. Except this time of year, w/ no a/c in it, it gets a little hot in the afternoon. It's so important to have your own space and your space reflects you! Perfect. I just repainted my office and it looks so much better--it's a robin's egg blue color. Just missing one thing--a dog curled up beside me. Do you miss Norway? I have not been inspired to blog at all lately. When I do, I either have the laptop on my lap in my recliner or at my kitchen table or I take it with me when I take my mother-in-law to the hairdresser. Once upon a time, I wrote at my secretaire, and only in the wee hours of morning. But now I have a baby, I've learned to write whenever, wherever. You adjust to whatever obstacles life may throw you. I write in our computer room, which also contains a spare bed, a small TV, and some of the kids' toys. It's not always quiet in here, but I find if I get up early and stay up late, I can get quite a lot done. I do most of my writing on my bed. With a pen and paper, because I can't concentrate on my computer these days! I wish I had a better spot, because the only view from my bed is straight into my (messy) closet, but ah well. Hi, I'm doing fine here, it's getting warmer as spring is setting its footstep in! Desk in the living room on my laptop is where I do most of my writing. The more romantic place is when I get my notebook, and write where ever the wind takes me. Wow I love the sound of your Norwegian writing spot. I tend to write sat on my bed with my laptop... it's the only place really to get a bit of peace! I like to write in scribblers because I am a longhand writer. I have them all over the house and carry one with me most of the time. I think my favourite place to write is in a noisy, busy area - somehow, it brings out the creative juices in me.